It was magical inside the great hall of Cairo University, said Emad el-Din Adib, one of the Middle East’s famous media personalities. He was one of the 3,000 people invited to listen to President Obama’s speech in person. Adib told an Egyptian TV show, “President Obama’s charisma is unquestionable, but it’s the substance and depth of his speech that made the hall roar.” Away from the hall, on social networking web sites the reaction was more diverse. Mina al-Oraibi, a columnist with the London-based Asharq Al-Awsat, said: “Obama mentioned the word peace 29 times and never mentioned terrorism.” She called his choices “smart” and concludes that peace is clearly “his priority.” This makes him “the radicals’ worst nightmare” she said. A very excited anchorwoman on Egypt TV told her guests and viewers that she counted 30 applause breaks during Obama’s discourse. She boasted as soon as the speech was over: “They were genuine cheers to a very good speech.” Her guests agreed that the speech was well crafted, clear and “honest” especially on the relationship between the U.S. and Israel. At one point, a man in audience shouted, “We love you” to Obama. The search is on to confirm the man’s identity and to see which point got the hardest applause during the speech. 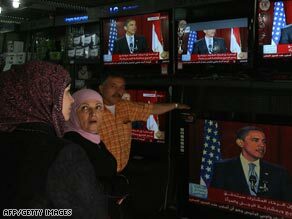 Major Arab networks carried Obama’s address to the Muslim the world live with simultaneous translation. Dubai-based Al-Arabiya channel showed people gathered to watch on location from major Arab capitals gauging reaction from Beirut, Baghdad and Riyadh. But perhaps the best reaction came from ordinary Arabs and Muslims plugged to their social media and expressing in real time how they feel about the message and its messenger. On Twitter, Ali from Iran sent a few dozen tweets with updates like “Iranians are following Obama’s speech on Voice of America which is illegal.” He also submitted comments from fellow Iranians who weren’t very impressed by Obama’s presentation. One of them said, “We must be defiant till USA makes some practical change, not only words.” This reaction is not much different from that of U.S. skeptics across the world. Another opinion worth mentioning is that Obama was using sweet-talk because he knows he can’t win militarily. Still the majority of the reaction was positive with people discussing how energized they are by Obama’s positive attitude and what Ali Dhamash from Jordan described as “understanding of what it means to be Muslim and appreciating that.” Dahmash, who commented on the speech providing all sides, from admiration to Obama’s democracy call to criticism at the lack of focus on Gaza’s plight. “Never seen such an applause and respect to an American president ever” he wrote to his Twitter followers. Minutes after Obama finished his historic speech, CNN correspondent Ben Wedeman’s phone rang. It was Walid Batouti, the owner of an Egyptian tour company, and normally a skeptic of U.S. policy in the Middle East. “Yes, we can!” he shouted, echoing the campaign slogan that brought Obama to power last year. “I’ve had my problems with the U.S. in the past, but it was a great speech, and we really appreciated it,” he said. Reza Aslan, the best-selling Iranian-American author of “No God But God,” was also a doubter before the speech. But his first response was a single word: “Wow!” “If the purpose of the speech was to forge a new beginning between the U.S. and the Muslim world, he did that,” he told CNN by phone from London. “He spoke in terms no American president has done before,” Aslan said, citing Obama’s description of the invasion of Iraq as a war of choice, and the word “occupation” in relation to the Israeli-Palestinian conflict. Aslan wanted Obama to press harder for democracy in the Muslim world, but did not actually expect him to do so while standing next to Egyptian President Hosni Mubarak, who has been in power for nearly three decades. In Pakistan, which the Obama administration has identified as one of its top priorities, the reaction was cautiously optimistic. But Imtiaz Gul, the head of the Center for Research and Security Studies in Islamabad, said Obama made some false steps. “Highlighting the billions of dollars in aid only plays up America’s arrogance,” he said. In the cafes of Baghdad, Iraq, people wanted less talk and more action. “This speech will not change anything,” said Hussein Mahdi, 52, a former military man. “We want something physical, something real.” Following a focused campaign to promote this speech and attract the attention, it seems clear that many Muslims and Arabs heard the clear message; it now can only wait the actions that will follow.